In this fourth and final post on the cost of cruising, I’d like to offer info I’ve collected over the years that may help those wondering how they will be able to live this lifestyle without a trust fund. In some cases, it involves cutting expenses, while from another perspective, it may be how to earn some income while cruising. They both help your goal of being able to live a cruising lifestyle. If you happen to have one of those mobile skill sets or occupations that can travel, you might easily find ready work whenever you stop. I’ve met sail makers, hair stylists, seamstresses, teachers, lawyers, tennis pros, mechanics, people skilled in outboard repair or varnishing brightwork, cooks, carpenters, canvas work, and lots of other folks who bring their work skills with them. It might allow them to stay in port long enough to replenish their funds, find meaningful work during the winter season (which for some adds much needed structure to one’s routine), or barter work when cruising. If you have a hobby skill or interest that could help support yourself while cruising, why not develop it into a genuine skill set before you leave? It also might add something of value to your cruising experience, bringing you closer to the local community and fellow cruisers. 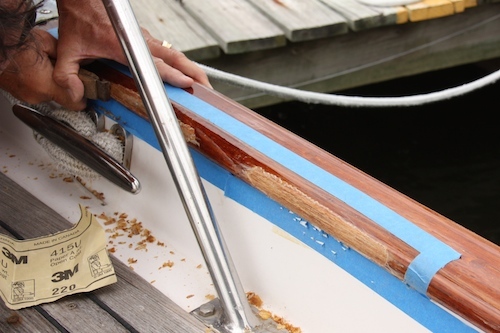 Learning to do canvas work, and having one of those great Sailrite sewing machines aboard, could allow you to operate a tidy little repair business from your boat. High quality maintenance of teak brightwork is a valuable skill and one that people will gladly pay for. I know a couple who took 18 years to circumnavigate, if I recall correctly. Michael is an orthopedic surgeon and kept practicing as he and Nancy went around the world, living in many interesting places for several years at a time. What an experience! Obviously, their situation speaks more to their style of cruising rather than keeping money in the bank. Another couple included a nurse, who said she was always able to find a job as long as they committed to stay for a period of time. Stay in Polynesia for a year? You bet! He found work teaching diving at a local shop. And if you have children, having them attend local schools in New Zealand or Australia is a fabulous way to provide your family with priceless experience not found anywhere else. Which reminds me of a retired couple whose children developed great confidence and self reliance early in their lives. When I spoke to the couple at our boat show booth, the woman told me her son grew up to become a Navy SEAL, followed by medical school. The daughter pursued a professional career as a merchant marine officer. She said the experience of going around the world gave her children such grounded perspective, confidence, and depth that they excelled when they returned to land. Attending vocational school courses, or electricians/mechanics training, not only provides you with potential portable job opportunities, but it also helps you do more of your own maintenance, surely a great way to not spend money on things you now can do yourself. This was mentioned in several earlier posts, where owners saved a bundle by removing a faulty engine part and reinstalling its replacement rather than relying on the expensive efforts of a yard mechanic. And it is not just about money. You get more familiar with your boat and its systems. Another really good idea before you head off on an extended cruise is to invest in a proper survey. Identifying issues ahead of time can save you thousands of dollars if you have troubles in some remote area. You better hope your boat chooses the right place to break down, as many areas have very limited or no services. Knowing your batteries are at the end of their lifespan, or a raw water pump or cutless bearing will need replacement sooner rather than later is good to know before you cast off. It is a very good insurance policy, to get a check up before you have issues, much like a medical and dental checkup before a major trip. That is precisely why some feel it best for their situation to sell their aging boat and buy a new one as they might enjoy ten years of essentially trouble-free cruising before things start wearing out. A survey also provides you peace of mind that the major things to worry about were inspected by a professional who deemed them good to go. Of course, there is no guarantee that the surveyor will find every fault, or correctly predict a failure in your electronics or power supplies, but the major elements that can cut short a cruise and dip into funds will be carefully inspected. It is money well spent. The more that you can do yourself, the better, for lots of reasons. In terms of cutting expenses, that is an obvious way to save money. But it also brings you closer to knowing your boat more intimately, to the point where a slight change in sound is often enough warning that something is amiss and needs attention. You never develop this sense of intimate connection when you pay others to take care of your boat. And then there is the sentiment of keeping the boat as simple as you can. 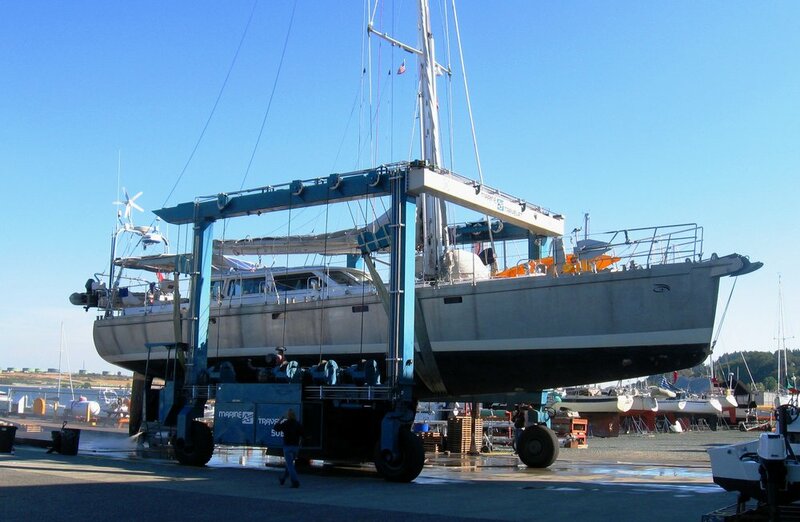 It won’t cost you anything to repair if it is not on the boat. Andy Schell of 59 Degree Sailing, operates Isbjörn, a 1972 Swan 48, with Mia Karlsson. Andy uses two iPads for navigation, one fixed at the chart table, rather than expensive chartplotters and integrated electronics that cost thousands of dollars and become obsolete after a year or two. He feels the iPad is a much better option, using a separate dedicated GPS to provide the iPads with accurate data. With todays’ solar panel and battery technology, and water and wind powered electric generators, it is now feasible to go without a diesel generator, once considered critical. As I mentioned in the last post, eating onboard will cost you less than the often expensive tourist restaurants and bars. That is not always the case, of course, as many remote destinations off the tourism circuit offer simple, local cuisine that can be enjoyed for a just few dollars. Local fish, beans, and rice is cheap and can be quite tasty and filling. I know many cruisers who make lunch their big meal of the day, eating a healthy meal at a quiet outdoor café. It is a great routine if it works for you. You can easily spend under $10 for lunch, while dinners are most often much more than that. You can drop a bunch of money at tourist eateries, especially after a couple of Pusser’s Painkillers. What I think most of the above implies is that you are not just aimlessly cruising, moving along like a gypsy. You are engaging and experiencing the world as you travel. Spending time involved with other cruisers and locals, rather than simply moving from one island group to the next. I knew a guy who circumnavigated with friends who joined for portions of his trip. He hardly got off his boat. To him, it was all about checking islands off a list. That’s not my style, and I would find that boring in no time. I much prefer getting into the local scene, and experiencing more than endless sea miles. Maybe that’s just me, but as I plan the next decade of my life, that is very much the focus. I had on my list of things to mention the subject of group buying power. While this is a limited situation, there can be times when your community of cruisers can collective make a bulk buy of something, receiving a discount because of the volume. I’ve heard it done with batteries and fuel, although I don’t recall the specifics. But if you and your buddies are all thinking it is time for some new gear, perhaps that is a way to get it for less. I hope these four posts provided some insight and practical information for sailors and trawler owners who either want to live aboard full time, or go explore the “world,” however they define its boundaries. It’s a big exciting opportunity, but to live it for real takes money. How much is mostly up to you.